Thank you, thank you, thank you all for a great year. I wish I could tell you that the Pacific Northwest District will be recognized as a Distinguished District, but the fact is that I just don't know. According to the numbers I have received so far it looks like we still need 10 more members. I know there are many of you out there looking to add friends and new members. Thank you. It has been a fantastic year. Thank you again for the opportunity to serve. I look forward to working with Bill next year and continuing to bring out the best in kids in the Pacific Northwest. Installation dinners are well underway and Optimist Club leaders everywhere are planning to hand over the bell and gavel to the 2011-2012 club and district officers on October 1. In just one day we will wake up to a new Optimist International administrative year. In anticipation, President Danny Rodgers logged on to his optimistarenaman account at YouTube today to say thank you to Optimist Club members and Friends of Optimists everywhere. Today is a good day to reflect on your club's accomplishments and do just a little bit more if that's what is required to make your club Honor. It's also a great day to say thank you to those who joined you on your journey in Optimism this year. Please share our appreciation when you do. Ask someone to be an Optimist today! Exciting news came in this morning via Facebook when friends and families of the Tri Cities Optimist Club learned that their club's annual NOW banquet welcomed 10 new members to their club last evening. Thanks to Lareena Roberson and Charlie Kissler for sharing that great news. What is your Optimist Club doing to ensure ongoing service to your community? There are nine days left for your Optimist Club to earn the coveted Honor Club designation for service in 2010-2011. Your help is need to add at least 20% new members over the beginning roster as of October 1, 2010. How will you make it happen? With applications in hand, visit some of your local merchants or area gatherings held by your chambers of commerce or other networking groups. Your club will grow only when you ask people to join the movement to bring out the best in kids. Download the applications now and just do it! Photo courtesy of Lareena Roberson. One the best ways to keep a positive attitude is to say the Optimist Creed. This year during the Optimist International Convention, Optimist International made a recording of Optimist Club members just like you reciting the creed. We hope that you enjoy it and then pass the Optimist Creed on to others who would enjoy its uplifting message. The Member Services department at Optimist International hopes that you might also make a recording of the Optimist Creed of your own. Why not take your Flip video camera to your Optimist Club meeting and make a recording to show the world how your Optimist Club thinks only of the best each week, and then upload it to YouTube or Facebook. Don't forget to send the link here so that we can help you share your voice with the world. 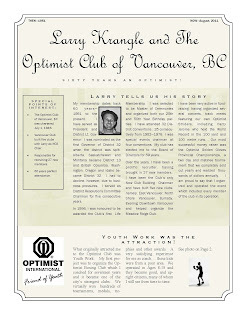 Larry Krangle has been a member of the Optimist Club of Vancouver, BC for 60 years. He was recently honored at the PNW District Convention for his many years of service. District Bulletin editor Gerry Morrison created a special addition to the September bulletin to share his story with others. Please click on the picture to read more. Just in time for the 1st Annual Wings & Things Ultimate Tailgate Challenge, the Twin Falls Optimist Club issued a new challenge to their club members. They said, "Let's add 20 new Friends of Optimists to our club so President Danny will come and visit us!" With the excitement for their new annual fundraiser, the Twin Falls Optimist Club has already added 38 new Optimist Club members to their roster this year. Adding just a few more might be a challenge, but according to membership recruiting mavens Barry Knoblich and Danae Climes, it is doable with a little help from their friends. So while they are cooking wings and chili in the park today, I imagine the Twin Falls Optimist Club members will be talking about how great it is to share their activities with others as a member or supporter of an Optimist Club. They will be asking others to get involved and join their club. 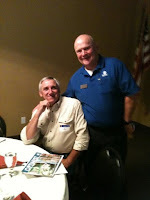 What is your Optimist Club doing today to add Friends of Optimists and traditional members to your list of volunteers? We know that the key is to just ask, but you have to visible in your community in order to find people to ask. Where will you find your next member? Where did you find your latest member? Please tell us; use the comment section to share your membership story today. Thank you! The Roseburg Optimist Club is planning their 36th Annual Respect for Law Banquet. It will be held Friday, September 16, 6:00 p.m. at the Douglas County Fairgrounds with a keynote presentation by Oregon State Police Superintendent Chris Brown. Hear president-elect Peter Sudduth describe the event on the KQEN Morning Show. You can join them! Tickets are $27 per person. Call to reserve your space today 541.430.3569. Q: What could be better than visiting the Columbia Gorge in autumn? A: Visiting beautiful Hood River, Oregon with your Optimist Club friends! 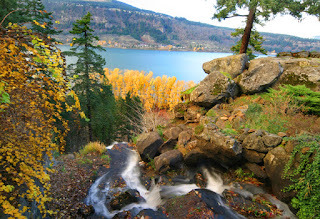 On October 14-15, Optimist Clubs from Alaska, Idaho, Oregon, Washington and British Columbia will gather in Hood River for the First Quarter District Conference of the 2011-2012 administrative year. Registration is now open for the First Quarter Conference and District Meeting. Register before September 26 for $68.00 US or CA. After September 26 the price raises to $78.00 US or CA. Registration includes lunch and dinner on Saturday. Click here to register now. The meeting will be held at the Best Western Hood River Inn. There are a limited number of rooms available for $89.00. Standard rooms are $99.00 and rooms with a river view are $119.00. Hurry and make your reservations by calling 1.800.828.7873 or 541.386.2200. Get your new Optimist Club year off to a positive start by attending the First Quarter District conference. It's the best way to plan for the months ahead. 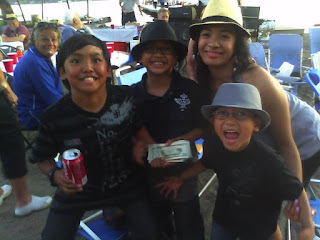 Marc Angel of Angelic Percussion shared a link on the PNW District Facebook page of Monica and the Dauz Brothers performing "Iron Man" and "Rolling in the Deep" at Ed's Beach Party at the District Convention. Eight-year-old drummer Angelo is his student. And don't forget to like the PNW District page while you are there. Click on the picture to watch the videos on the PNW District YouTube Channel.